May is now over and we’re heading towards the mythical British summertime. However, as much as we wish that it will be a perfectly delightful three months filled with sunshine, ice-creams and ice cold drinks, we all know that we need to be prepared for all weathers. Thankfully this is exactly where the Comfort Craftsman boot from R M Williams comes into their own! The Craftsman is one of the best-selling, and best loved boots in the R.M. Williams range, and rightly so. 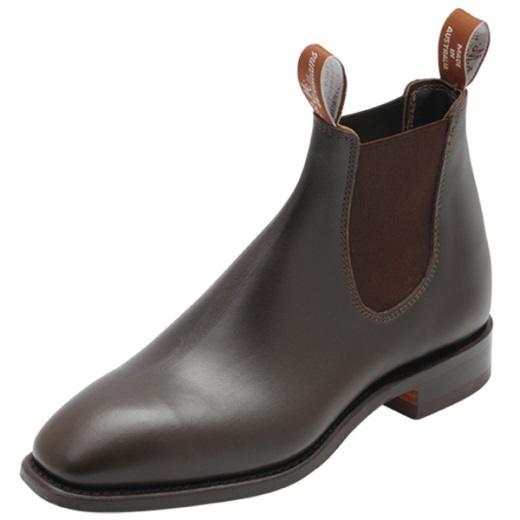 Unlike other brands, this quintessential Chelsea boot is made from one piece of leather, joined at the back. Not only does this mean that they more likely to spare your feet from rubbing, but also makes them tough and waterproof. Perfect for a showery walk! The one piece of leather is also premium grade yearling, which is one of the reasons a Comfort Craftsman is so beautifully soft and smooth to the touch. 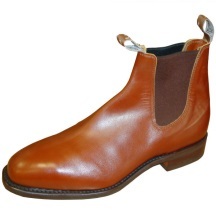 You also know you can expect quality with an R M Williams boot. The Craftsman are one of the signature boots in the range, and as such the top nine employees in the Adelaide factory (who between them have around 275 years of bootmaking experience!) are the only people who work on this particular design. The boots take a week to create and undergo around 80 different hand-held processes, but if they are not signed off by two separate bootmen they won’t be sold. But most of all the joy of owning a pair of Craftsman boots is their versatility. The classic stockyard design with the refined chisel toe will look stylish no matter what you’re doing. From a busy work meeting to a sedate country walk, it will never look out of place. Furthermore, the boot is so comfortable that you will never feel the need to change them! They have a stacked layer leather heel for optimum shock absorbency, and an oil resistant comfort sole that ensures you are always sure footed. So to make sure that you’ve got the perfect boot no matter the weather or occasion, look no further! We stock Craftsman boots in a wide range of colours, sizes and widths, including a gorgeous whiskey colour that would be perfect with a pair of R.M. Williams’s Moleskin jeans. There’s no excuse not to have a pair in your wardrobe! P.S. R.M. Williams boots are fantastic because it is possible to revamp all but the one piece leather upper (you can change the linings and elastic if required, as well as resoling and reheeling them). However, to keep them looking as good as possible we at Philip Morris & Son would definitely recommend using the company’s range of boot polish and, leather conditioner and saddle dressing. That’s why we’re giving away a free care product with every pair of boots purchased from our website. Add to this free delivery to the UK mainland, and what’s not to love! Australian, Chelsea boot, Comfort Craftsman Boots, Country Clothing, Handmade, Leather boot, Philip Morris & Son, R.M Williams, Review. Bookmark.